I usually only post what I have written or channeled, but the below article so important that I wanted share it. Before It’s News -Perhaps overshadowing the discoveries of the tomb of King Tut and Troy is the discovery of Atlantis. Now two bold scientists, Paul Weinzweig and Pauline Zalitzki, say they have found it. They discovered the ruins of the ancient city submerged off the coast of Cuba. In the distant past the region was dry land, but now only the island of Cuba remains above water. The ancient city is 600 feet below the ocean and the team of researchers led by Zalitzki Weinzweig is convinced that it is Atlantis, the city lost by more than 10,000 years. Two scientists, Paul Weinzweig and Pauline Zalitzki, working off the coast of Cuba in a submersible robot, have confirmed that there is a huge city on the ocean floor. The site of the ancient city – including several sphinxes and at least four giant pyramids and other structures – is surprisingly within the boundaries of the legendary Bermuda Triangle. According to a report from Terra Forming Terra Arclein, Cuban Subsea Pyramid Complex, the evidence suggests that the city was flooded simultaneously with the rising waters and land subsidence in the sea. This corresponds exactly to the legend of Atlantis. The disaster could have occurred at the end of the last Ice Age. As the Arctic ice sheet melted catastrophically causing the sea level to rise rapidly around the world, especially affecting the Northern Hemisphere. The coastlines changed; land was lost, islands (including the island continent) disappeared completely. At end of the last ice age sea level were lower than today’s levels of nearly 122 meters. Theoretically, any technology then or now, could have saved Atlantis from its watery grave. The evidence that the earth, in what is now the Caribbean, also sank in the sea seems pretty certain. Cuban Missile Crisis Halts ResearchAccording to journalist Luis Mariano Fernandez the city was first discovered decades ago, but all access to her was arrested during and after the Missile Crisis. “The U.S.government discovered the alleged place during the Missile Crisis Cuba in the sixties, nuclear submarines cruising structures found (in the deep sea) with a pyramid in the Gulf. Immediately shut down the site and took control of it and objects, so that will not reach the hands of the Russians. “The scientific team of experts from the ocean, oceanographers and archaeologists found ruins of ancient buildings of 183 meters below the ocean. They say the city is Atlántida (Atlantis). Could this discovery change the vision of the history of mankind? Yes, it could change everything. It also adapts to the stories about the sudden disappearance of Atlantis wonderfully. Atlanticú. Atlantis. Aboriginal natives still call in its history. The Olmecs and other native peoples all have primary morphology marking the arrival of this continent. This means coming from the direction of Cuba, and had to occur in a very large earthquake where their land sank. Morphologies indicate that they belong to three families who were saved. One of these families came to the coast of Veracruz, which are supposedly the Olmec. Others came to Central America and traveled to the Pacific coast, and these families created the civilization of the Americas as we know it today, because they distributed all their knowledge. When anthropologists saw these underwater carvings, stone monoliths, some symbols and inscriptions, they were identified with Olmec motifs. They were very surprised. Thank you Suzanne for all the work you are doing, please accept my imaginary hug. Andrew Collins just e-mailed me a few minutes ago! It was very kind of him to explain the situation to me. There is no conspiracy, simply human necessities. Paulina Zelitsky and Paul Weinzweig held out as long as possible for the best possible deal on world rights to release pictures and video footage of what had been found. I know, I was involved with the deal from Random House, and was to have ghost written the accompanying book, which would have been accredited to them (I was chosen since the agent working on the project was working with me also, and I had just released GATEWAY TO ATLANTIS, which pinpointed Cuba as the site of the main island of Atlantis). The figure on offer was six figures in pounds sterling (based on a sliding scale of what had been discovered), but Paulina Zelitsky and Paul Weinzweig refused the offer, wanting even more to fund their future expeditions. They hoped that NatGeo would top the offer. However, when finally the pair released video footage of what they had found it was deemed both of poor quality and not what was hoped, and since Zelitsky and Weinzweig had run out of money, a stalemate ensued. No further footage could be got, so the Random House offer (which they could have taken) was withdrawn. I have no idea what offer NatGeo made, but I suspect it was afterwards withdrawn also. Zelitsky and Weinzweig had to go back to what they know best – treasure hunting and vessel salvage, and no one has heard from them since. They have simply vanished off the map. This said, I firmly believe that prehistoric archaeology does await discovery off Cuba, and hopefully within the next year I will take part in a major expedition to identity suspected structures off both the north and south coasts of the island. Cuba is by far the best candidate for Atlantis’s flag ship, and one day hopefully we will be in a position to prove that. What exactly Zelitsky and Weinzweig discovered remains a mystery. Whether artificial structures, ballast from Russian submarines or natural features, we might never know. All theories are possible. It is likely that the location of Atlantis is much larger than a single spot. Some contend that Atlantis extended from the Azores to the Caribbean on multiple large islands. We are constantly discovering huge ancient stone man-made complexes in the oceans all around the planet. When the water levels were MUCH lower, these would have been on dry land. 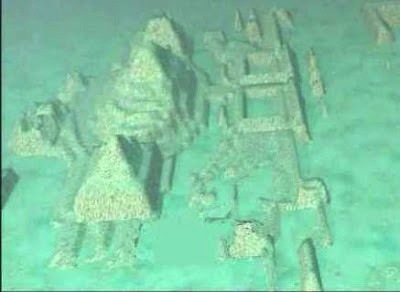 ‘Atlantis And Other Lost Worlds’ discusses significant underwater structures off Bimini & Japan. In 1949, Egerton Sykes updated Ignatius Donnelly’s 1882 ‘Atlantis: The Antediluvian World.’ It discusses deluge legends of many countries & Atlantis links w/ other civilizations. A scientist’s view of how Atlantis’ destructions could have happened very quickly as described in Plato’s account. This is out of print, but can still be obtained through second hand book stores. This Scribd copy wasn’t an exact copy of the book I have, but seems to cover most of the same information. A very good option for those who can’t obtain the book at a reasonable price. A download for this book. While many underwater structures are explained (dismissed) as natural occurrences, this would be very difficult to apply to this instance w/ a huge carved statue. LOL. MANY links to ‘ancient underwater cities.’ They are in numerous oceans. it explain a lot about the sinking of Atlantis and also the lost continent of Lemuria. There is so much light in this book. No doubts you will like it if you are looking for answers regarding Atlantis and Lemuria.